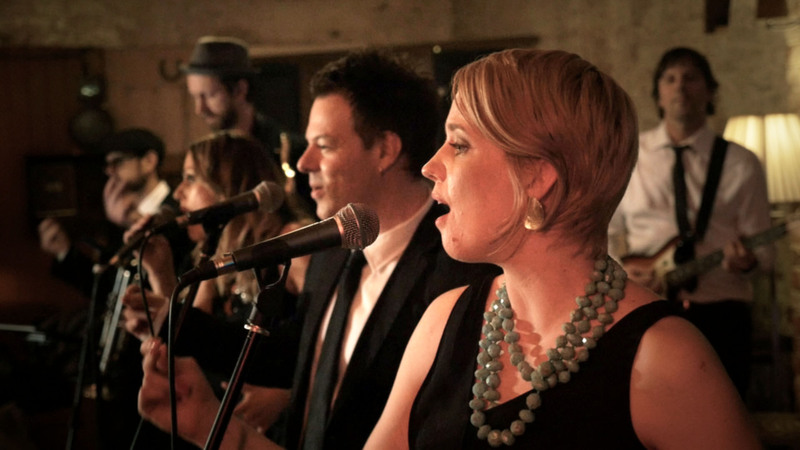 Melbourne Hit Parade is an impressive all-live band featuring some of Melbourne’s most talented musicians. We’re a sophisticated and energetic band, priding ourselves on presentation, performance and professionalism. We have a vast ever growing repertoire covering all the classics, including 70’s disco, soul, rock as well as current top 40 hits and more. Melbourne Hit Parade can tailor our look and style to suit any event, from intimate or extravagant weddings, to spectacular corporate functions. You can choose a rocking 4-piece quartet or a mind-blowing 11-piece band. Depending on the venue, event and your budget, we can deliver a flexible solution. Members of the band have years of professional experience from all corners of the Melbourne music scene, working with and alongside Tori Amos, Goyte, Nelly Furtado, Jessica Mauboy, Leo Sayer, Guy Sebastian, Jimmy Hocking, and many more. The band will accommodate literally any style or theme. We guarantee your night to be a great success, always delivering a high standard of music performance and entertainment to get any audience straight up and dancing the night away. “We both want to express our sincere thanks to Melbourne Hit Parade for the amazing job they did performing at our wedding reception. A really talented group of musicians and singers who performed with so much energy and enthusiasm; and who kept our guests (and us) on the dance floor. I love that we were able to choose our favourite songs from your extensive song list. We especially want to thank you for being so accommodating with our special request. Darren’s performance of L.O.V.E was a real highlight of the night. It was a pleasure dealing with you in the lead up to the wedding. I very much appreciate your prompt replies to my emails and your flexibility in catering to our needs for your performance. Would highly recommend Melbourne Hit Parade.” Thank You”! “Thank goodness for the Melbourne Hit Parade. Talented musicians. Our guests were already dancing during the dinner music! Not only was the music exceptional, but Bec pretty much ran our wedding. She took personal responsibility for the smooth running and timing of our reception. Everything ran like clockwork, and we attribute that to her. Speeches and sets ran smoothly. They learned our wedding dance song. Everyone commented on the band and told us how much they loved them. Our dance floor was packed the entire night. We couldn’t recommend them more highly”. “WOW!! By far the best band we have ever heard! They rocked our wedding so much that there was not one person sitting in their seat the entire night – they were all up on the dance floor and they kept the party going! The way they can read the crowd and play to the hype is exceptional, not to mention amazing voices. We went with the 8 piece and they really made the night come alive”!